Online ticket sales have ended for this event. Generally, online ticket sales end at the start of the show. After online sales end, tickets may still be available at the door unless the event is sold out. Even if an event is sold out, a stand-by line will available at the box office in case of no-shows. The best improv comedy talent in Connecticut: Sea Tea Comedy Theater's Improv Comedy Night! Improv Comedy Night features our house improv teams -- performers assembled and chosen by Sea Tea Comedy Theater's artistic directors to put on amazing shows for you! These teams get together, take your suggestion and run with it! Improv Comedy Night shows feature each group doing their own set of improvised comedic scenes. Some shows even feature special finales like one-night-only combinations of that show's teams or jams & lotteries with chances for audience members to come up and perform (if they want)! 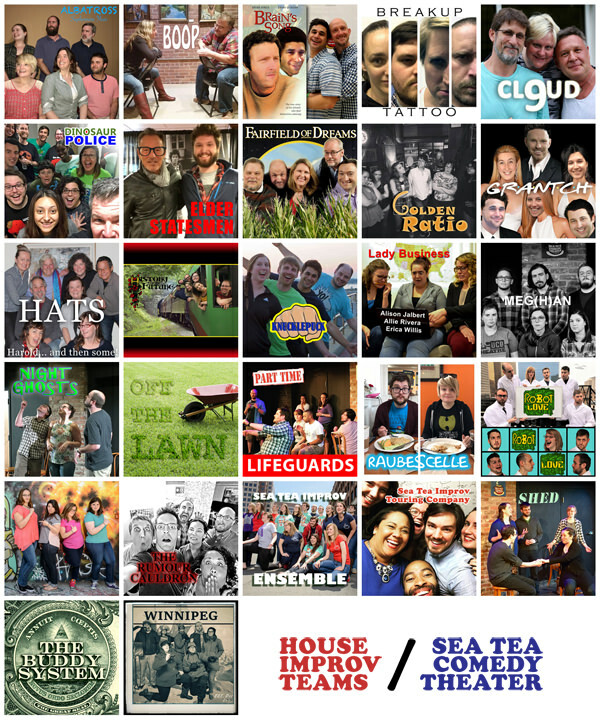 These improv comedy groups have performers that have studied improv comedy at Sea Tea Improv Studios and other comedy training programs. They have performed at the Hartford Improv Festival and other improv festivals. Every night is different -- that's their specialty! SAT, FEB 23 @ 9 p.m.
FRI, MAR 1 @ 9 p.m. SAT, MAR 2 @ 7 p.m.
FRI, MAR 8 @ 9 p.m. SAT, MAR 9 @ 9 p.m.
FRI, MAR 15 @ 7 p.m.
FRI, MAR 22 @ 9 p.m. SAT, MAR 23 @ 9 p.m. SAT, MAR 30 @ 7 p.m.
FRI, APR 12 @ 7 p.m.
FRI, APR 12 @ 9 p.m. SAT, APR 13 @ 7 p.m. SAT, APR 13 @ 9 p.m.
FRI, APR 19 @ 7 p.m.
FRI, APR 19 @ 9 p.m. SAT, APR 20 @ 9 p.m.
FRI, APR 26 @ 7 p.m. Imported Improv feat. Future Wives from NYC!